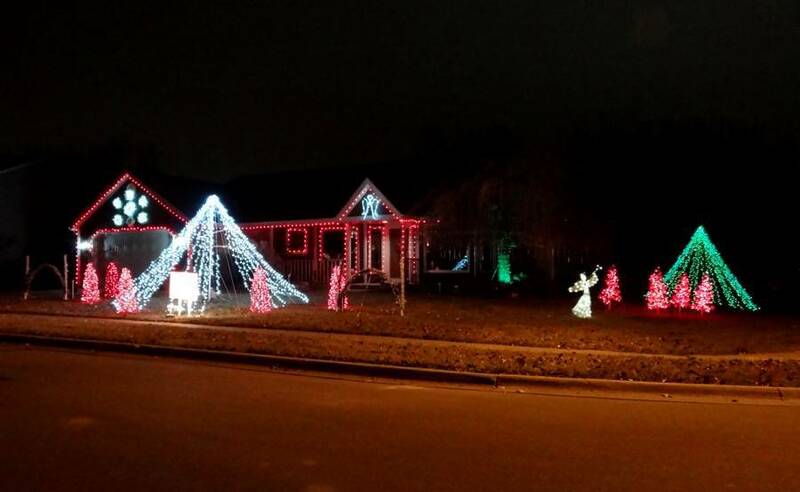 Monday - December 1, 2014: This was another night of extensive scouting of Christmas displays in Overland Park (I went out checking, at least briefly, every night for about 10 days.) One of the pleasant surprises was how much the "Holiday Lights at the Farmstead" ar Deanna Rose Children's Farmstead had improved in its second year. Tuesday - December 2, 2014: Back out checking Christmas displays in Leawood, we stopped for supper at Imo's Pizza in Overland Park. This 135th Street location is the only Kansas location for the St. Louis pizza chain. It had been about a year since we had been to this restaurant, which is included in our Overland Park Restaurant Guide. We went on south to Edgerton where Kenny Pritchard had invited us to see his "Candy Cane Lane." There were no lights on and the many inflatable fixtures were not running. We called Kenny's number, but there was just an answering machine. After leaving voice mail, we headed back out of town, but had a call back from Kenny just after leaving town, and after waiting for a train, returned to his home, where he was starting the 20 minute task of turning on the large display. 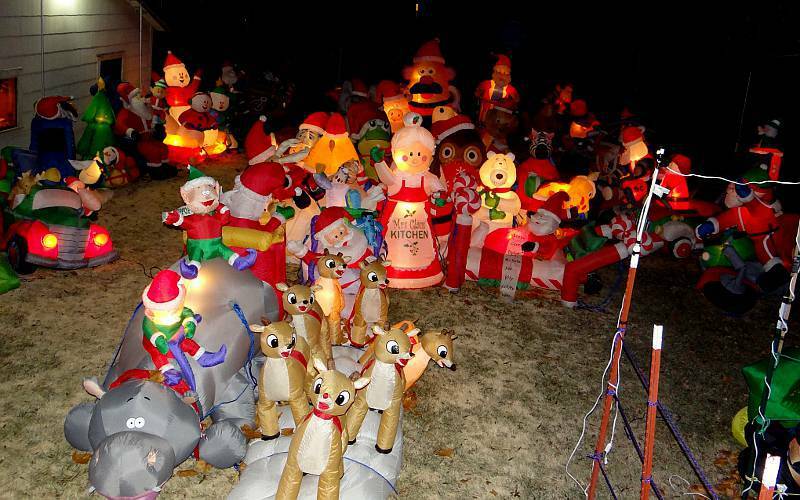 Candy Cane Lane has about 125 Christmas inflatables and over 200 other items & lights. 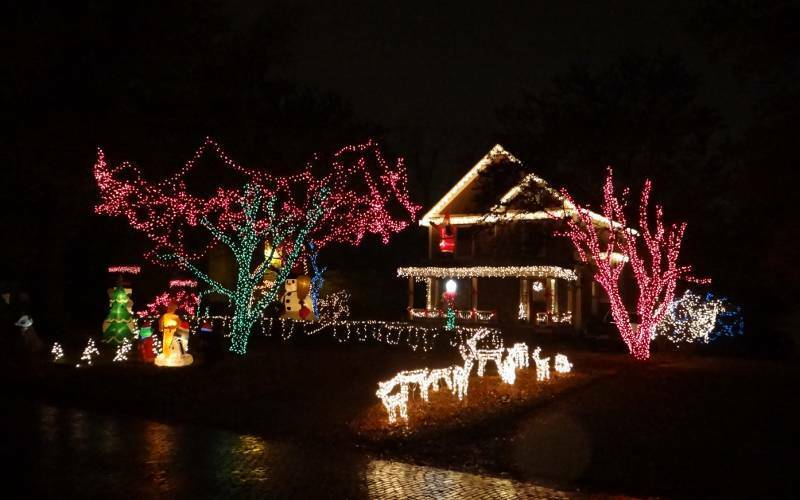 They fill the Pritchards' yard and their neighbor's yard and visitors are invited to walk to the back yards to see the rest of the Christmas display. A new page devoted to Edgerton Candy Cane Lane has been added. Thursday - December 4, 2014: Tonight we drove to Lawrence to check out the displays in the Lawrence Christmas Light Tour. As an experiment, we drove the route in the opposite direction from previous years and it worked enough better that the route has now been reversed. We already knew that some displays had not gone back up for 2014, but we had to remove only one other displays from the tour and were able to return one other display which had dropped off in 2013. 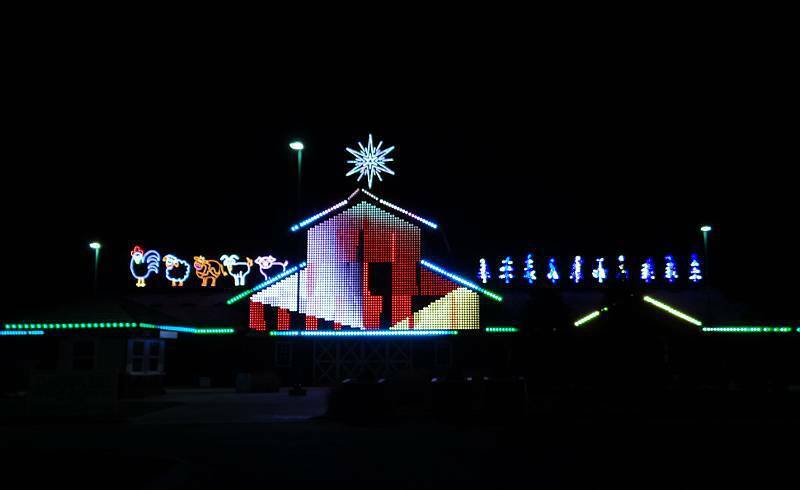 The display in the photo to the right is Howe Family Christmas Animated Light Display in south Lawrence. 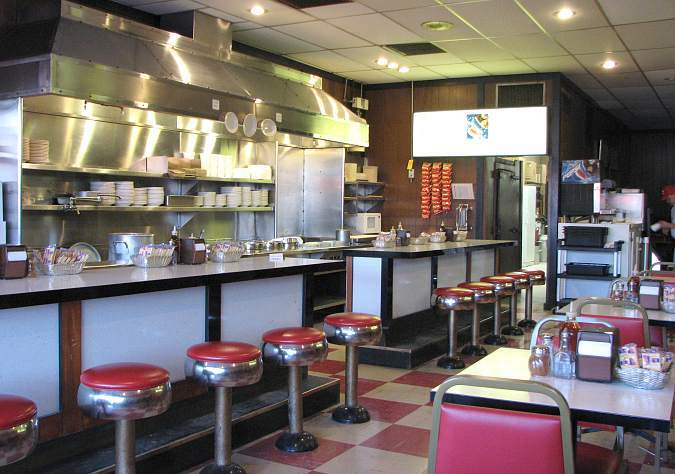 Friday - December 5, 2014: This evening, I dined at Fritz's Chili in Overland Park, which began 41 years ago as a Dixon's Chili parlor. 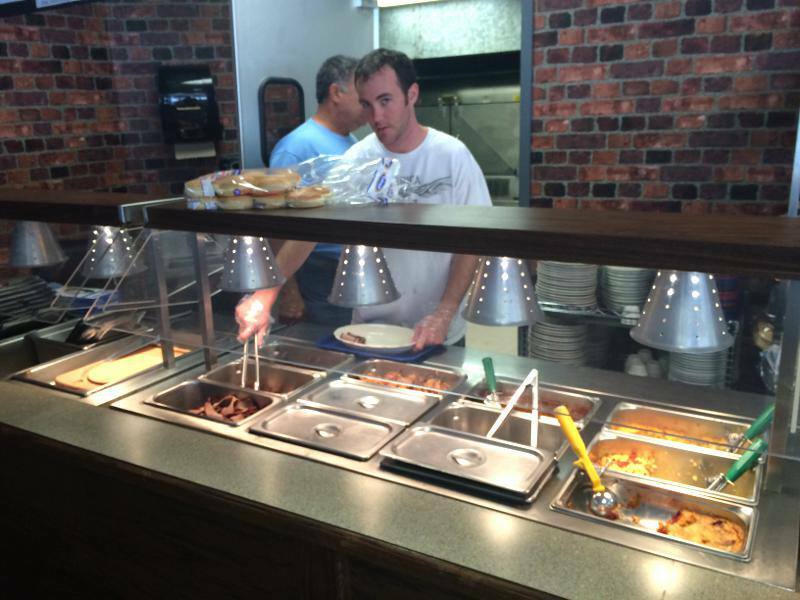 Although Fritz's has a loyal following, it isn't listed here as much for the food, as for the tradition and atmosphere. The fixtures date from the restaurant's opening. Other than an increase in some prices, Fritz's is little changed since our last visit, three years ago. Saturday - December 6, 2014: Linda joined me for lunch and we returned to within a block of Fritz's Chili as I update the Overland Park Restaurant Reviews. Burg and Barrel is a 2 year old gourmet burger bar, which moved into a former location of The Peanut. There were a few changes since our last visit, notably, most items have gone up $1 in price and the three booths which were the only seating that wasn't on tall stools have been removed. Sunday - December 7, 2014: Linda and Mary joined me in driving to Topeka, where we were joined by Lyle Wilson and visited all the Christmas displays from the 2013 Topeka Christmas Light Tour. Only one display had to be removed from the previous years tour. The most interesting new display, was one of the homes in Potwin Place (see photo at right). Before the tour, we revisited Speck's Bar and Grill which has been on our list of Unique Kansas Restaurants since 2005. 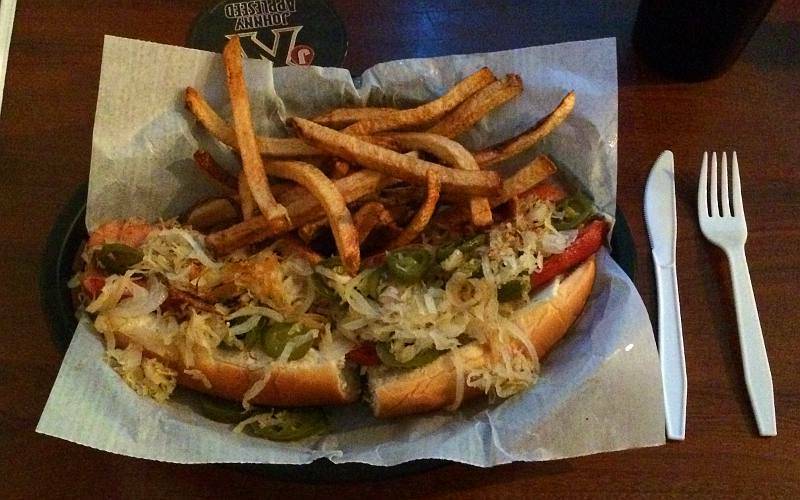 I thoroughly enjoyed their grilled half pound bomber dog smothered in Swiss cheese, jalapeno peppers, sauerkraut and onions. Friday - December 12, 2014: I was on my own for another evening of checking out new displays for the Kansas City Christmas Light Tour. I found displays worth adding to the tour in both Gardner and De Soto. The one at the right is on the south side of Gardner. 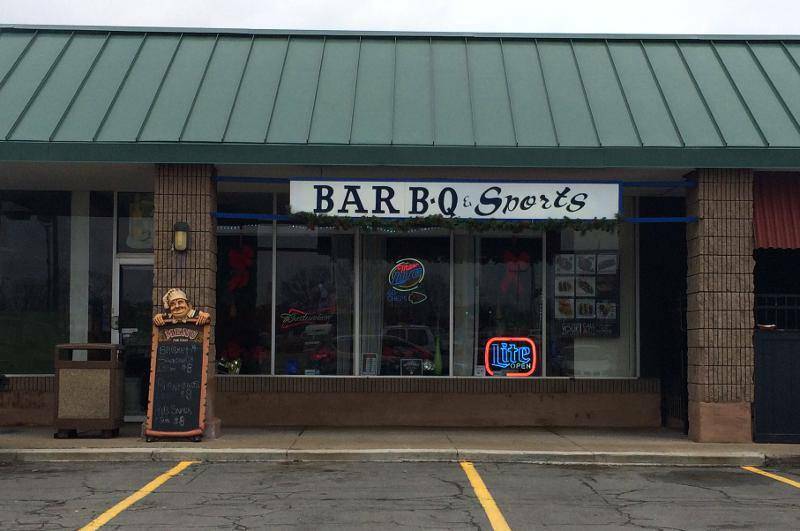 Saturday - December 12, 2014: Since we were already going to Kansas City, Missouri to see a University of Kansas Jayhawk's basketball game, it seemed like a good time to check out the new Char Bar, a BBQ restaurant in the Westport neighborhood. bucket of fries, jar o' pickles & two junior nice fixin's. My favorite dish was our appetizer - the lobster deviled eggs. 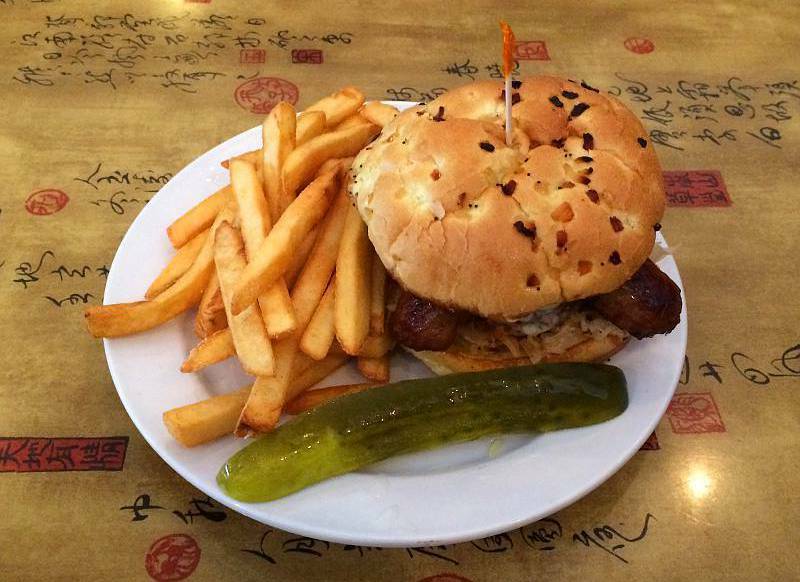 Friday - December 19, 2014: Yesterday's special at the Downtown Diner in Olathe was a Sheboygan burger (burger, Swiss cheese, Italian sausage, grilled onions, sauerkraut). It sounded fabulous, but I didn't see it on Facebook until after lunch. When I commented on that, the owner offered to male the same sandwich today. It was even better than it sounds. Rich and Sue Caines are working on a new menu and this sandwich may be one of the 4 or 5 new burgers to go on the new menu. Saturday - December 21, 2014: I added a new page for one of Kansas' unique attractions, the They Also Ran Gallery in Norton, Kansas, which we visited in July. It is devoted to Presidential Candidates who were defeated, and it has received a lot of attention from around the country. Sunday - December 22, 2014: We have another new page, devoted to the Missouri Pacific Railroad Depot in Waterville, Kansas. The Waterville Railroad Depot was built in 1870 and moved to its present location in 1982. The modest museum does not maintain regular hours, but volunteers are happy to schedule an appointment to show you through the museum. 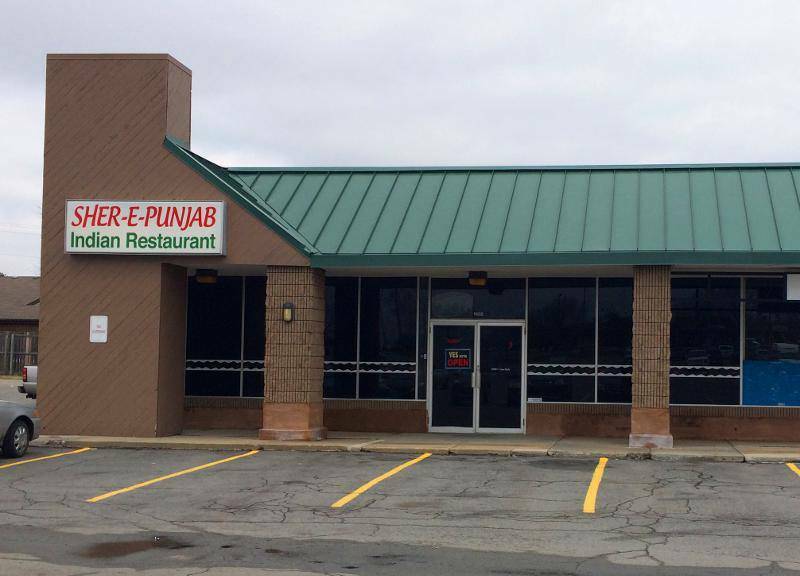 Monday - December 23, 2014: At lunch, I visited Olathe's newest restaurant, Sher-E-Punjab, which just opened on Friday. It is the first Indian restaurant in Olathe and has been opened by the owner of Maharaja in Blue Springs, Missouri. They have a lunch buffet Tuesday - Sunday. I thought the food was a little bland, but it is a little soon to be making a judgment about this new restaurant. Friday - December 26, 2014: Today's lunch was at a second new Olathe restaurant, just 3 or 4 doors from the one where I dined on Monday. It is a 5 week old BBQ restaurant, Despite what it says on the sign, the name is actually Jonathan's Gourmet Wood-Fire Grill. The burnt ends were tender cubes which tasted like roast beef. I didn't notice flavor from the smoking or rub. The sauce was dark, thin and had tiny pieces of some vegetable or spice in it. The chef wouldn't say what was in the sauce, but I think there was some cocoa. The chef said he has 25 sauces, but this is the one for the holiday season. Monday - December 29, 2014: Now that it has been open several month, we made a third visit to Fireside BBQ in Overland Park. They had added several items and I wanted to try them, particularly the burnt end chili and the French fries. The chili wasn't a stand out, but was fairly good, if a little too bean heavy. The fries appeared to have been baked, rather than fried, and were disappointing. One big improvement was that the meats were all warmer than they were in October.